Jevian Toledo. Photo by The Racing Biz. 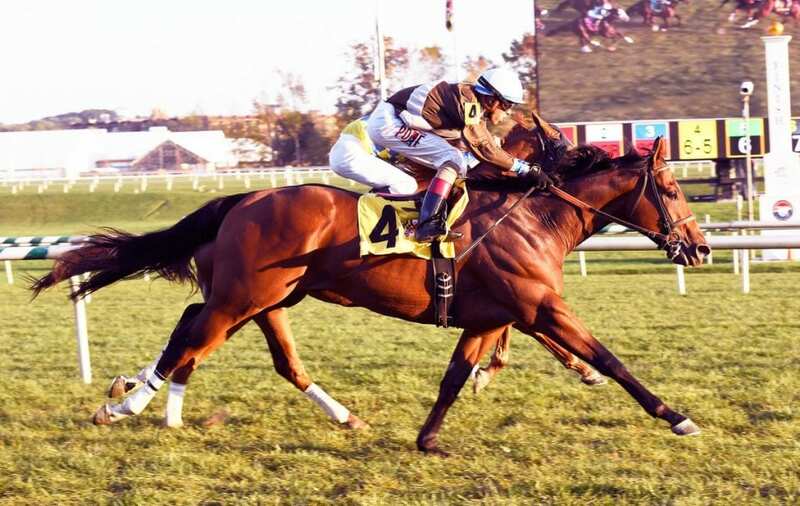 Hillwood Stable’s Top of Mind, a tough-luck second in the Commonwealth Turf Cup (G2) last time out, rated on the inside before moving out wide and powering down the stretch to win Saturday’s featured 10th race at Laurel Park. It was the third win in four starts for the gelded 4-year-old son of Hall of Famer Curlin, all since being switched to the turf by trainer Rodney Jenkins. Sent off as the 6-5 favorite in a field of eight older horses, Top of Mind ($4.40) ran 1 1/16 miles in 1:40.81 on a firm Fort Marcy Turf Course. With regular rider Victor Carrasco back aboard, Top of Mind was unhurried settled along the rail as Find Stakes runner-up English Minister led through an easy quarter-mile in 25.16 seconds and a half in 49.10. English Minister was still in front rounding the far turn when Carrasco steered Top of Mind to the outside to launch their bid. Top of Mind gained steadily down the stretch to take the lead in the final eighth of a mile and outrun a stubborn English Minister to win by a neck. Iconic Artist prompted the pace all the way around and held on for third.